It is 1995 and Noa and Amir have decided to move in together. Noa is studying photography in Jerusalem and Amir is a psychology student in Tel Aviv, so they choose a tiny flat in a village in the hills, between the two cities. Originally called El-Kastel, the village was emptied of its Arab inhabitants in 1948 and is now the home of Jewish immigrants from Kurdistan. Noa and Amir's flat is separated from that of their landlords, Sima and Moshe Zakian, by a thin wall, but on each side we find a completely different world. Next door lives a family grieving for their eldest son, killed in Lebanon.His younger brother, Yotam, forgotten by his parents, turns to Amir for friendship. And further down the street, as he works at the building site, Saddiq watches the house...In this enchanting and irresistible novel, the narrative moves from character to character offering us glimpses into their lives. Each of them comes from somewhere different but there's much about them that's the same. 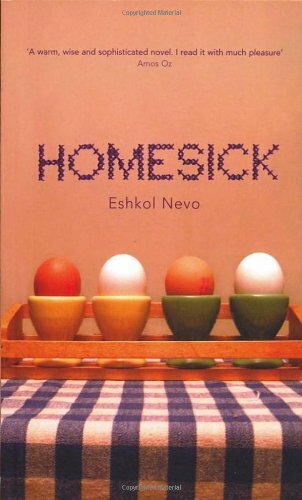 "Homesick" is a beautiful, clever and moving story about history, love, family and the true meaning of home.